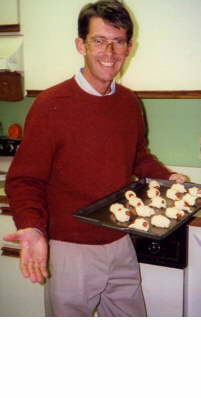 Brother, Peter Boughton, departed on 26 December 2002 after a ten year bout with esophageal cancer, which caused a gradual wasting away and ultimate demise. He was in the company of his wife Lee and daughter Deborah when he passed comfortably in a Ft. Lauderdale ICU. In the early Spring of 1969 Peter (an MMFN) was completing BES and I was an instructor (as an ET1) in the FBM Training Department of Submarine School. I had received orders to the USS Halibut and Peter had wished to accompany me in this tour. I managed to set these orders up and off he went to join the 587 A-Gang. As it turned out, a few months later, I was accepted into the NESEP and was off to Vanderbilt U while Pete sailed off to SubPac. He spent only a few months in Halibut but was talented in his trade, well liked and admired for his wit, being the prime nick-namer for the boat. Known as "Skinner (Back)" - don't know which individual got tagged "Milkerdown" - he also named a Filipino COW "Applebunks" for the well-remembered, but dreaded, 1MC "Now, Up All Bunks......". A manning shortfall caused a transfer to USS Haddock later that year where he continued his talents "as a Turd Rancher" and honed his wit on any target of opportunity either on-board or in his adopted home - the PH SubBase EM Club. He completed his tour and hitch in Haddock, and returned to the commercial HVAC in the Boston area. He gradually migrated to Florida and was last employed as a Special Projects Manager with the Boca Raton Resort. His personality and wit never left him. He is greatly missed by all who knew him.